Reports of retail’s death have been greatly exaggerated. Traditional retailing is not dead, but it must adapt to changing customer demand and the impact of digital. Even though many traditional brick and mortar retailers are struggling, there is reason for optimism. According to TimeTrade’s State of Retail Survey, 85 percent of respondents said that if an item were available both online and in-store, they would rather make a purchase in the store. A recent Galaxy report was even more bullish showing that out of 1,250 people surveyed, 94 percent preferred to shop in traditional brick and mortar stores. However, and this is the key, half of the people surveyed said that they went online to research retailers’ products and services before purchasing in-store. Digital has fundamentally changed the retail landscape and the amount of information consumers have access to in order to make highly informed purchase decisions. This has elevated consumer expectations as your customers expect to be known and understood regardless of the channel and expect interactions with your brand to be consistent and unified. I’d like this item, with these attributes, available in this channel and in my hands when I need it, exactly how I ordered it. Please make the entire process easy, seamless, convenient and fast regardless of channel, even if I want to return your item. I don’t want to be treated like a transaction. I’m not an order; I am a person. Communicate and interact with me accordingly. Know my preferences and order history and be able to locate an item for me, whether I am in the store, online or talking to your call center reps. I have lots of shopping options, so every interaction counts. I want to feel like you see me and that I matter to you. Can you promise me you will deliver against my expectations? If you keep your promise, I’ll likely be back! These are the expectations that retail customers have today. If an organization cannot deliver on them, the customer can very easily find another avenue where their expectations can be met, whether that is with a brick and mortar competitor or one of a multitude of online retailers or e-commerce giants. Fortunately, the path to fulfilling those customer expectations is achievable through retail operations excellence starting with a focus on empowering your store associates. Let’s face it. Digital technology can be great and enable new possibilities. But sometimes customers just want to talk to a human. Because of the proliferation of digital technology, humans in retail are more important than ever. Ultimately, shopping is an experience, and in the end, all purchases are emotional on some level. Apple has discovered that “the secret to success in retail is for stores to become places that people come to experience products, not just buy them.” There is no better way to provide that experience than through store associates. Associates must be empowered to enhance the customer experience. On the managerial level, store managers must be given the autonomy to do what is best for their customers. Store policy set in New York that works in a Fifth Avenue store might not have the same effect at a mall in Omaha. Managers should have the ability to differentiate in a way that positively impacts their customer base. Okay, so you “get it” - store associates are the key to your in-store success. Now you may be asking, how do I actually support my associates to maximize their impact? One of the primary tasks of a store associate is to validate a decision that the customer has made already by comparison shopping online. 90 percent of shoppers browse online before going into the store to complete a purchase. 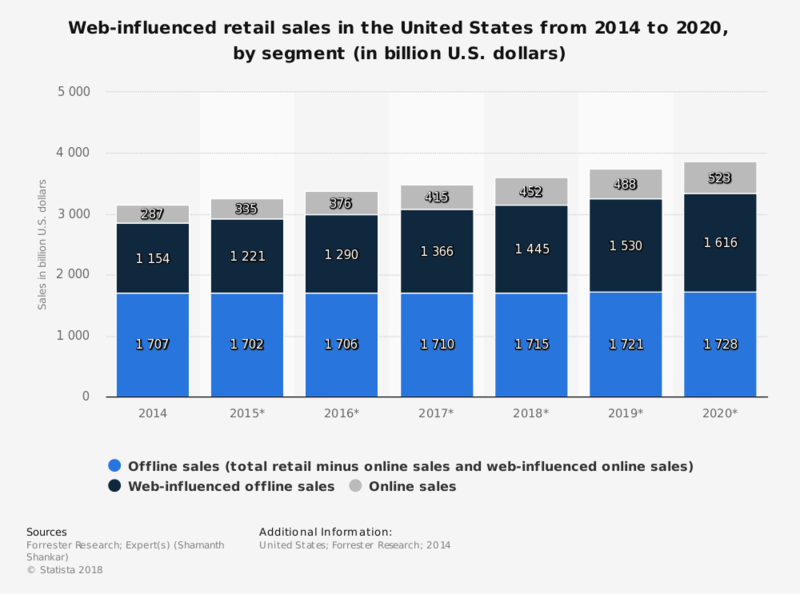 Forrester data suggests that pure offline sales will remain flat while web-influenced offline sales and online sales will continue to grow. Sales people cannot just be sales people, they must become advocates for their products. Associates should be prepared with a review of products that indicates familiarity. Any consumer can go on Amazon to find dozens of reviews or find a friend who has the product, but these are added steps. If a store associate is prepared in this way, it reduces the friction for the customer in their decision process. Executives should position their managers and associates as brand ambassadors. Sales associates should have access to smartphones or tablets on the show floor in order to best help customers in their purchasing decisions by providing complementary product selections or finding answers that customers might have. Another strategy is to use texting or social media to check in with customers after a sale. Hotels use this strategy with great effectiveness after a guest has checked in with a simple “Hi, this is Jane, thanks for choosing Hotel California. Please let me know if you have any questions.” This is also very common on social media where brands respond to even an indirect mention about a purchase or a customer service need. Again, all shopping is inherently emotional, and these types of experiences lead to a positive association with the brand, which helps increase the chance of future store visits. Customers should be encouraged to touch or try on the product. The sense of touch is a powerful motivator. Physically holding products can create a sense of psychological ownership, driving must-have purchase decisions. Store associates should be positioned throughout the store to encourage this “interaction” between consumer and product. The sense of touch is not the only motivator; stores should try to engage all of the senses. Retailers should learn to use their product to their advantage. Lotions should be able to be smelled and sampled, linens should be able to be felt, electronic devices should be played with, and furnishings should be sat in. 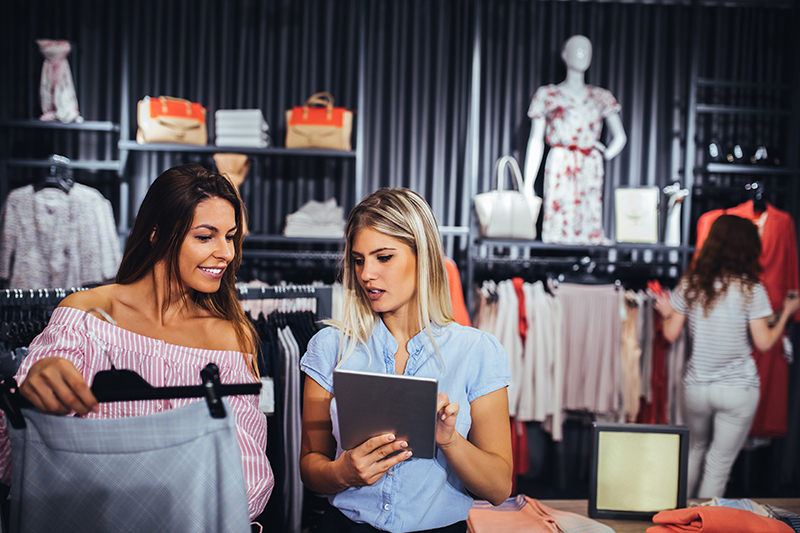 As an example for clothing stores, associates can encourage this by seeking out customers holding merchandise and ask if they can “prepare a fitting room.” This encourages customers to take the next step in the process without having to think about it. Store associates should also be in a position to “save the sale” when there is no stock in the store or other situations arise where cart abandonment might be an issue. They should have the knowledge of alternative options if a product is out of stock and be able to convince the consumer to take advantage of those options within the same chain of stores. Some alternative options for fulfillment include placing an online order and shipping it to the customer’s home if the purchase is not time sensitive, or alternatively, locating the product at other locations within the area and either direct the customer there or have the product transferred to the store most convenient to the customer. One of the most beneficial fulfillment strategies is to have the customer pick the product up in a physical location. Using buy online pick up in store (BOPIS) leads to consumers spending more money once they are in the store. 75 percent of consumers using BOPIS make an additional purchase while they are in the store. Getting your customers in the store gives your associates the opportunity to up-sell and cross-sell your products. When your associates are knowledgeable about your products, they can instinctively offer up-sells and cross-sales that make sense based on what the customer has already picked out. For example, they could turn the purchase of a tablet into a tablet with more memory; or perhaps headphones and a case to go with the tablet. There are many opportunities for store associates to be a determining factor in purchase decisions, helping convert customers who are merely browsing into a closed sale. However, store associates are only one pillar of retail store operations. Process and technology improvements play a large role in the in-store customer experience as well and will be covered in subsequent posts. enVista has extensive, real world consulting experience guiding many retailers through the journey toward unified commerce and is able to quickly identify strategies and opportunities in store operations that make the most sense for your company and focus on optimizing profit, not just increasing sales or minimizing costs. Some of our offerings include customer journey mapping, store operations, associate training, change management and more. enVista has 17+ years of consulting experience, and we’ve worked with leading retailers to get their store front and back-end operations in order. Learn more by exploring our retail consulting services. Ready to talk? Reach out to start the conversation!